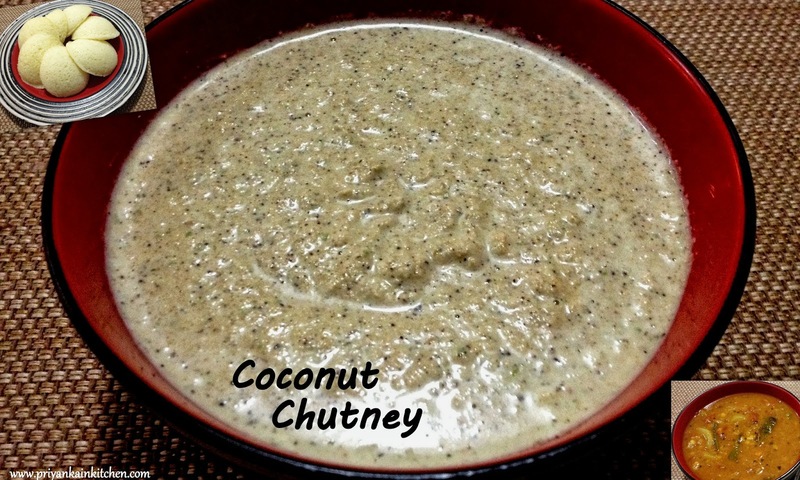 Coconut Chutney is a traditional south Indian dip with coconut as it main ingredients. It is one of the most common dips that is served in all south-Indian restaurants. It is a mild dip and is truly versatile. Here is my version of making this dip. 1 tbsp chana daal/ split and skinned Bengal gram soaked for 15-20 mins. Strain Bengal gram and keep aside. Heat oil in a pan. Add Bengal Gram and roast it till it starts to change color on medium heat. Add mustard seeds, slit chilies and curry leaves. Reduce heat and roast until Bengal gram turns totally golden brown. Add coconut and roast for one more minute. In a grinder, grind this along with yogurt and salt adding minimal water to a smooth paste. Serve at room temperature with Idli, Dosa or Rice.